LIC’s popular money back plan Bima Diamond (Plan No 841) is a close ended plan and is scheduled for a withdrawal on 31 st August 2017. Bima Diamond plan was introduced to commemorate the 60 th anniversary and diamond jubilee celebration of LIC of India. The plan is considered as the successor of the erstwhile popular plan Bima Gold from LIC of India. Bima Diamond is a non linked (not connected with share market) , with profit, limited premium money back plan where money back shall be available on every fourth year and maturity at the end of the term. Another attraction is the extended coverage which is available even after the maturity of the plan. LIC Bima Diamond – Important facts. You can use the premium calculator from InsuranceFunda to calculate all details of premium with latest GST rates by clicking on the link provided below. 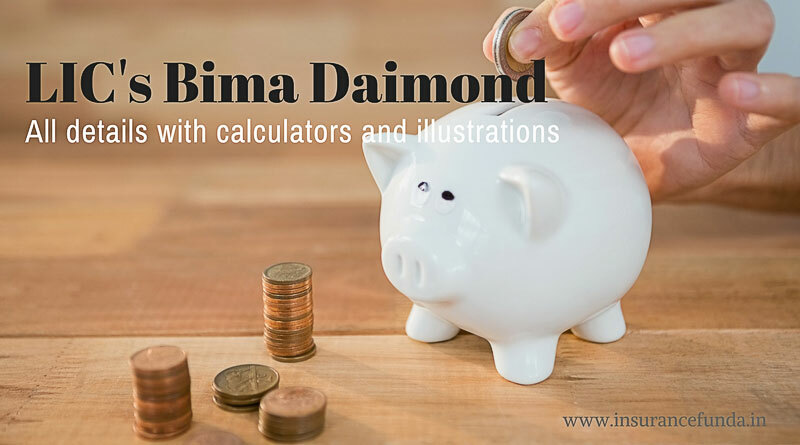 Use the maturity and benefit calculator provided here to get a complete idea on all the benefits available for Bima Diamond plan. Benefits are calculated online based on the values supplied by you like Age, Sum Assured, Term etc. Survival Benefit: Survival Benefit at the rate of 15% of Sum Assured Payable on every 4 th year for 16 year and 20 Year schemes. On the other hand Survival benefit at the rate of 12 % of Sum Assured payable for 24 year term on every fourth year. Maturity Benefit: On completion of the term, Balance of Sum Assured after paying Survival Benefit, along with Loyalty addition will become payable. Death Benefit: Death benefit under LIC Bima Diamond policy can be summarised as follows. 3 Death after the term of the policy but before the end of an additional period of half the policy term (after maturity) -This period is called Extended cover period. 50 % of Basic sum Assured paid as death claim. LIC’s Bima Diamond (Plan 841) – Illustration of benefits. In order to understand the details of the plan, let us take an example. Let us consider that a person aged 35 years takes a Bima Diamond policy for a sum Assured of 5,00,000. Let the term of the plan be 20 years. The premium for the proposed plan will be as follows. Now let us consider other benefits for the proposed policy. Premium payment is for 12 years as shown in the illustration below. After 5 years insurance coverage increases as Loyalty addition also become payable along with coverage. Money back at the rate of 15% of Sum Assured shall be paid on every fourth year. You can also see that there is an extended coverage after the completion of the term of the policy. The extended coverage is for 50% of Sum Assured and will be available for half the term of the plan and in this case it is for 10 years. The above illustration is for a person of age 35 taking a plan for 20 years and the sum assured is taken as 5 lakh. You can calculate details based on your own data for premium and benefit calculations using the links provided above. You can also click on the illustrations shown above to open the calculators. *The benefit illustrations shown above are just for understanding the basic details of the plan. Please go through LIC web site for more details. The loyalty additions can vary based on the experiences of LIC of India. ← Reduce home loan interest – What you should do now ?